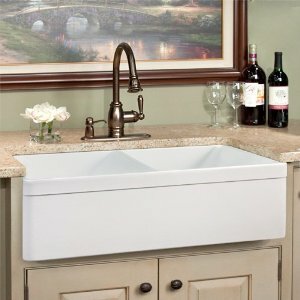 A new trend in house remodeling is the choice of an extra-deep sink. Under-mount sinks, farmhouse sinks, and deep sinks that reach 10+ inches are all becoming popular choices for homeowners interested in keeping up with home design fads. There is a problem that can arise though when you go to install a standard garbage disposal after you have installed your new deep sink. The disposal’s drainage pipe, if set at a standard height, will now be located too high to properly drain the garbage disposal unit, which can cause backups and clogging. If you find yourself with a love of deep sinks, but still in need of the conveniences and green living standards of a garbage disposal, there are options available. InSinkErator, the inventor of garbage disposals, has a solution. The InSinkErator Evolution Compact is designed for tight fits, small cabinetry, and lack of space due to an extra-deep sink. The height of the ISE Evolution Compact is 12 1/8 inches, considerably less than other models on the market. It still delivers a ¾ Horsepower, powerful 1,725 RPM motor that will easily and quickly grind up food waste in seconds. Bones, coffee grounds, fruit rinds, carrots and other fibrous vegetables will be disposed effectively and efficiently, even in this compact model. Essentially, you do not need to sacrifice power for space. The grind chamber still has a capacity of 34.6 oz which is quite sufficient. When you choose an ISE product, you are also getting SoundSeal technology which makes this disposer 30% quieter than other models on the market. That’s a great feature all around. See my complete InSinkErator Evolution Compact 3/4 HP Review here. If you have purchased a deep sink to install in your kitchen, do not fret that you may not be able to use a garbage disposal. InSinkErator has a number of units that are designed for different purposes, and this one is no exception. The Evolution Compact will easily fit into your cabinetry, even under a sink as deep as 10 inches. 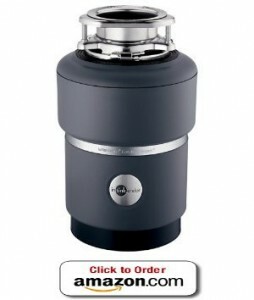 The best price I found for the InSinkErator Evolution Compact is at Amazon here.